Expect long lines at Apple Stores today for the long-awaited Apple Watch. This year alone UBS expects Apple to sell 25 million of them, with annual shipments reaching 68 million by 2018. Apple has a tendency to swoop in and dominate markets, as it did with smartphones, tablets, and personal audio, so it's not a big stretch to expect the company to accomplish the same thing with wearables. If so, it could open up a major new digital marketing channel uniquely suited to wearable tech. In the early March demo event, Apple VP of technology Kevin Lynch used his Apple Watch to take a call, watch a video, and open a garage door among other things. And like other smartwatches, it can do things like track your heart rate and tell you when you've been sitting around for too long. An accelerometer measures total body movement, calories burned, and number of steps per day, and there's potential for countless health related applications, which is great news for healthcare digital marketers. Here are 3 reasons why the Apple Watch will be the new marketing frontier in healthcare. Consider this: health professionals know vitamin D deficiency is associated with all sorts of health woes, from osteoporosis to cardiovascular disease to colon cancer, and getting enough sunlight causes the body to make vitamin D. Suppose you're in the risk group for one of these diseases and your PCP prescribes not a pill, but an app for your Apple Watch that measures how much vitamin D you get during the day. In addition to being like a virtual mom on your wrist ("Get outside and get some fresh air. "), it's a subtle, continuous advertisement for your healthcare provider. The possibilities are almost limitless. Weight loss doctors could develop custom step-counting or calorie-tracking apps, cardiologists could develop activity trackers, and dentists could create apps that remind you to floss. It's really wide open right now. 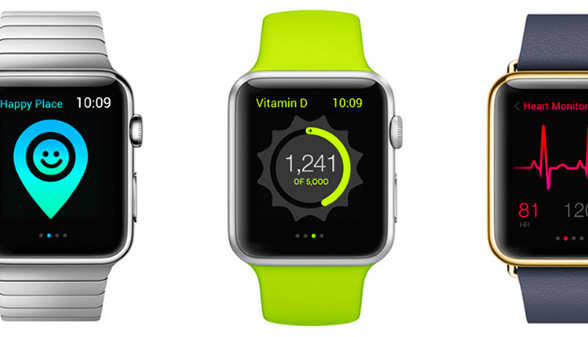 The Apple HealthKit API allows health and fitness apps to share data with each other. Users' health information is stored securely in a centralized location, and users can decide which data is shared. What this means is users can elect to connect their favorite health apps with a healthcare provider's patient portal that collects lab results, blood tests, and other health data. Ultimately it should help both doctors and patients understand and manage health better. Through the Apple HealthKit API, users could go about their everyday lives while their apps sync with their healthcare providers' portals, reporting relevant information to care providers and building a more comprehensive health profile, allowing for better care. You might not think medical research would have marketing problems, but think again. Apple is working with doctors, hospitals, and app developers to create apps that allow users to share personal health data for the purpose of improving medical research. In a video presentation for Apple's ResearchKit, the company featured a breast cancer researcher who had trouble soliciting participants for a survivor study, getting only a few hundred responses back after sending out tens of thousands of letters. But these apps will empower millions of people around the world to participate in medical research, allowing them to be reached more easily, and eventually to transmit data right from their Apple Watches. One example is an app developed for Parkinson's disease research. Users cycle through several short tests that assess disease progression, balance, and gait, and the data can be transmitted to researchers or caregivers. Not only can this help researchers learn more about Parkinson's progression, it can help healthcare providers communicate on a regular, personal basis the importance of exercise in slowing the disease. The Apple Watch should open up a new frontier for healthcare digital marketers, with its strong focus on health, nutrition and behavioral-changing apps. Healthcare marketers have become adept at "traditional" digital marketing, including websites, email, content marketing, and social media that tend to focus on a prospective patient in need of care. Mobile and wearable technology, on the other hand, are expected to become the new differentiators catering to both the sick and the healthy. The healthcare marketers that embrace these technologies are the ones that will set the narrative and get out ahead of the competition. Shawn Gross is the Chief Digital Strategist, Healthcare Practice Lead for White Rhino in Burlington, Massachusetts where he helps health care organizations buildcontent rich, patient-centric websites and addictive digital health services. Shawn was previously the head of digital marketing at Tufts Medical Center, Floating Hospital for Children and Massachusetts General Hospital and can be reached at shawn@whiterhino.com.